We just upgraded our stores with Magento Commerce 1.5 and wanted to share the new features that were introduced in the latest update. The latest update basically doesn’t change the framework and schema of the store a lot which means that upgrading to the new version will not be difficult for your existing stores. The templates, skin and customisation should not break with the new version. 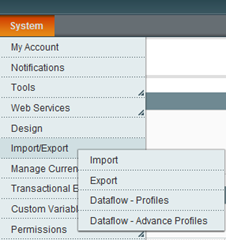 System > Import/Export now has the ability to pick Import or Export and export. You can then pick what data to export (Products / Customers) and what attributes to filter the data with. You can also modify an order address after an order. You can change the Billing Address as well as the Shipping Address using the edit buttons next to the order. The 1.5 Magento Commerce comes with a new Magento Connect Manager Upgrade. The new version is 2.0 of the Magento Connect Manager. The new direct package installation means that you can build your own packages and install them without the extension key. Thanks for posting this! I’m looking for a medium that can help us to get a good amount of promotion for my websites which in return gave me a business too through websites and I must say this has definitely helped me in this process. HOW does one upgrade from v 1.4.2 to 1.5.0 ?? You have to be very careful when upgrading Magento so please view resources in Magento Wiki before your follow through with the upgrade. There are a lot of things that can go wrong and result on your Magento store being unavailable. Obviously we won’t be responsible or able to support you if that happens. – Make sure you backup your data and your site files first. Magento will show you all the upgrades next to your plugin/package. The important one is the Mage_All_Latest and Mage_Core ones which you need to upgrade. so that you dont have a lot of downloaded files in your server. I have used OSCommerce and Magento Commerce (preferable). This time I am trying to create a public store (products viewable by everyone – I know how to do that) as well as an area where select few customers can login and it will show them products that are only for them. Hence a personal e-commerce store for specific customers. Does anyone know if Magento supports that? If not, any other software package that will allow that?